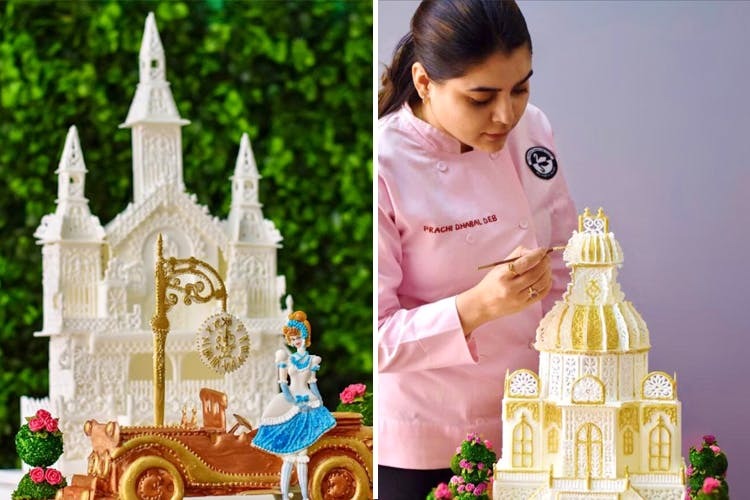 Pune-based award-winning cake artist, Prachi Dhabal Deb bakes the most stunning cakes with intricate royal icing embroidery, inspired by Swiss castles, Mughal architecture, French fountains and more. A former financial anayst by profession, Prachi’s baking journey started back in 2005. Her passion to perfect the art of royal icing, an extremely intricate decorating technique, took her to many parts of the world. An alumna of Cake Expression & Sugarcraft Malaysia and Sir Eddie Spence MBE from London, Prachi has been extensively featured in various global platforms including Cake Central, the Cake Magazine by ACDN and World’s Best Wedding Cakes” by Amy Doak. Today, Prachi is the owner of Cake Decor India and her clientale boasts of high-end builders and event management companies, across India. Coming back to her exquisite portfolio of cakes, Prachi tells us how every tiny detail is hand-piped with royal icing. Her creations are reflections of fairytales in cream and delicate roses. From a gingerbread themed birthday cake to a marble palace inspired from a book by Herman Hueg, Prachi’s designs will make your jaws drop hard. One of our most favorite creatives, was this cake in black. The colourful floral embroidery in royal icing combined with red butterflies, give this wedding cake an extremely exotic touch. What’s more? She can bake the same one or any other cake in eggless option too! Now, it’s no surprise that Prachi’s creamy creations are on high demand all year round. She says, for December, the order were placed in July. Prachi and her team needs at least 20 days of notice to make a cake of your dreams. So, if you have a cake in mind and you know the date of your event, we recommend you get in touch with her soon. Loved what you saw? Follow Cake Decor India on Instagram here. Want to learn the art of royal icing? Prachi is organising a two-day workshop for students on November 18 and 19, November 21 and 22 and December 5 and 6. You opt for any one of the batches. The seats are limited, so make sure you register soon. A dream wedding is incomplete without a dream cake. So, if you’re tying the knot soon, get in touch with Prachi and get an unbelievably beautiful cake made.